The site plan has the new school located behind the current building, though the entrance still faces toward Playfield Street. Plans for the first floor call for a learning commons, cafeteria and gym as well as pre-kindergarten, kindergarten and first grade classrooms. The building’s second floor will house collaborative learning areas as well as second, third, fourth and fifth grade classrooms. A concept rendering of the new learning commons. Concept rendering of a first grade classroom. Concept rendering of a fifth grade classroom. 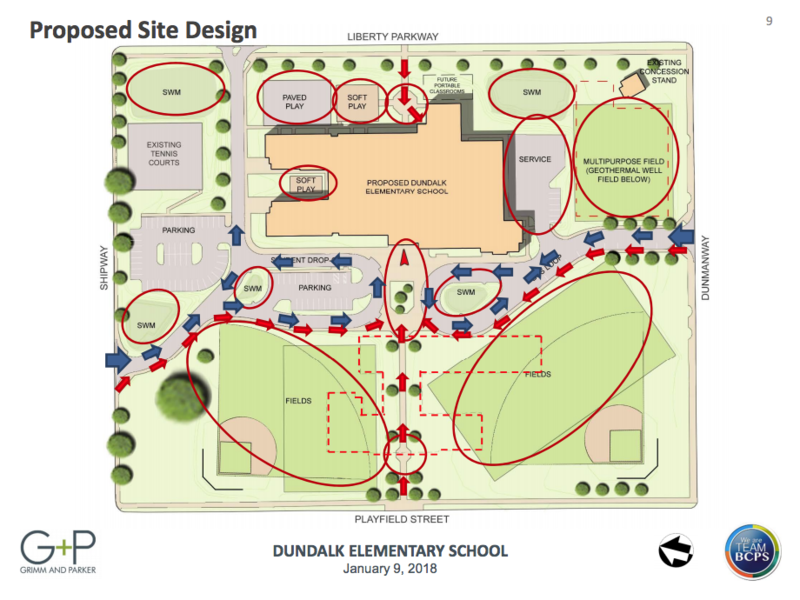 Years of lobbying by parents, staff and students is finally bearing fruit as construction begins on the new Dundalk Elementary School. The new building will replace an aging school that has been plagued by electrical, plumbing and other infrastructure issues. The new school is being built behind the current building, on the site of what were athletic fields and tennis courts. Students will continue to attend classes in the current school during construction. According to Pete Dixit, executive director of Physical Facilities for Baltimore County Public Schools (BCPS), site preparation work is currently underway. This includes storm water management controls, sediment and erosion controls, drilling wells to provide water service to the site and the installation of an energy-conserving geothermal system. This work is being done in order to comply with state regulations, according to Dixit. According to a BCPS design presentation, the school’s layout will be similar to the design of Essex and Mays Chapel elementary schools. Currently, the school is over-capacity, packing 685 students into a building rated for 590 students. The new school will have a state-rated capacity of 735 students. According to BCPS, the new school will support 21st century learning, including classrooms with integrated technology, collaborative spaces and spaces for hands-on learning, including maker spaces and a learning commons. The school’s design will also be environmentally friendly, using recycled and locally-sourced materials and featuring shared spaces, an energy-conserving geothermal heat pump system, a vegetative roof, outdoor learning area and low water-use plumbing. The design boasts a LEED (Leadership in Energy and Environmental Design) Silver Certification. Safety and security measures will also be incorporated into the new school, according to BCPS plans. Safety measures will include areas to separate pedestrians from vehicles as well as separate areas for cars and buses. Security-wise, the building design will allow public areas of the school to be secured from academic areas. The new school will also include a lockout vestibule, lighting and landscaping to allow for maximum visibility and a total of 57 cameras (37 inside, 20 outside) and a card-reader system. Construction is slated to continue until July 2019; the new school is tentatively scheduled to open for the start of the school year in September 2019. Once the new school is completed, the current building will be demolished to make way for athletic fields. Site restoration work should be completed by August 2020. According to Dixit, while the current school will be demolished, the school system has worked with the Maryland Historic Trust to ensure that elements and artifacts from the historic building are preserved. Last May, local residents met at the school to discuss the future of the 92-year-old school building. The meeting was required by the Maryland Historic Trust as the current school has been listed on the National Register of Historic Places since 1983. 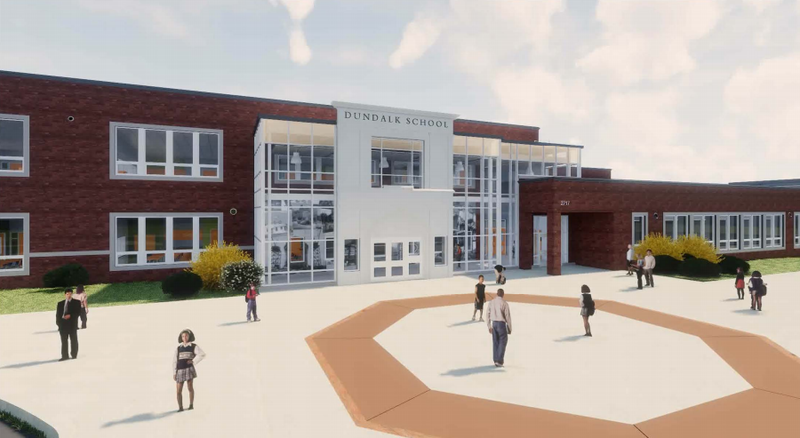 As Dixit noted, several design elements from the current building will be preserved and incorporated into the new building, including the existing chimney, historic entry arch bearing the words “Dundalk School” and the wood-carved proscenium above the stage. In addition, key items and artifacts will be saved for display in the new building. While construction will continue on the site into next year, the Dundalk Heritage Fair will go on as planned from Friday, June 29, through Sunday, July 1, according to both Dixit and Heritage Association President Joe Falbo. According to Falbo, the only change that the public will notice is that the carnival rides and games will be a bit closer, moving forward into the parking area adjacent to the school’s playground. The vendors usually located in that area will be moved into the park. There will also be less vendor parking on the fair grounds, though parking for attendees will be unaffected. Falbo expressed excitement for the fair, anticipating a packed house for acts like Vince Neil, who will headline the second day of the fair. “We’re ready to roll,” Falbo noted. Now that work is underway on the new Dundalk Elementary, replacements for Berkshire and Colgate elementary schools are not far behind. Both schools should begin construction next year; both are slated to open for the start of the school year in September 2020. Berkshire students will be able to attend classes in their current building while a new one is constructed on the grounds. However, a lack of adjacent space will force the demolition of the current Colgate Elementary before construction can begin on a new school. Colgate students will be relocated to the Rosedale Center on Philadelphia Road during demolition and construction, according to Dixit. Currently, Victory Villa Elementary students are being housed in the Rosedale Center building while their school is completed. Those students are slated to move out at the end of this school year and back into their own school this fall. While the exact timing is still being finalized, Dixit noted, facilities crews will clean and make minor repair to the Rosedale Center this summer in anticipation of the arrival of Colgate students. Demolition of the current Colgate building is schedule to begin later this year, according to a preliminary design presentation. While Dixit was reluctant to estimate how much the new schools will cost, he noted that it will be in the same range as other elementary schools built in the past. The new Mays Chapel Elementary School, opened in Timonium in August 2014, was constructed at a cost of $24 million.